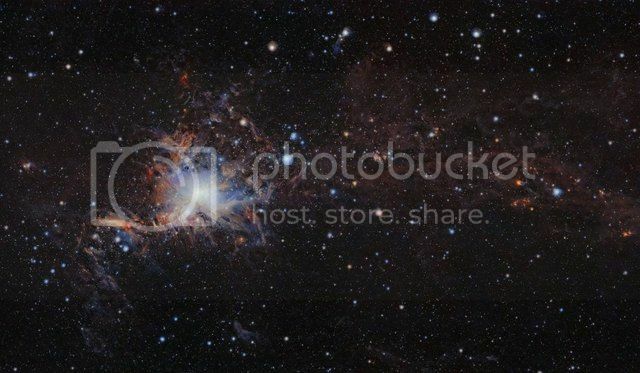 One of the most gorgeous things..in my opinion..is a nebula. I love outer space photos. They are some of the most amazingly beautiful things I have ever seen. That one looks almost like it is alive, doesn't it? Like all that stuff on the inside is actually growing there. Can you imagine what it would be like to be there inside of that thing? I think they're pretty too Jo. The Great Nebula in the constellation of Carina is a massive star-forming complex located about 7.5 thousand light-years away. The main star in the complex, Eta Carinae, shines brightly in the southern sky. Its ensemble of stellar clusters are young and hot, with ages that range from less than about one million years to about six million years. Altogether, the region contains one of the richest concentrations of massive young stars in the galaxy. In addition, the region is rich in non-stellar material including filaments, pillars, cavities, arcs, and other features indicative of a turbulent and complex history. The Nebula is full of mysteries because the numerous complex structures have proven difficult for astronomers to explain. Some scientists think there has been an early epoch of active star formation in the region, and whether or not a supernova may have gone off in the neighborhood is actively debated. 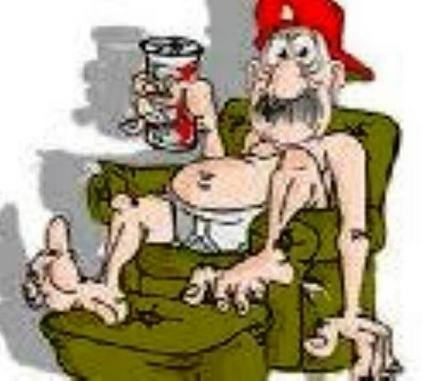 The role of intense shocks and colliding winds in generating the hot diffuse gas that is seen is also controversial. 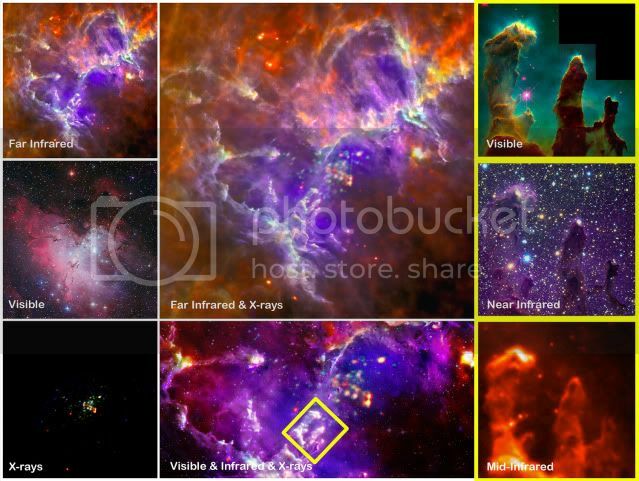 The combined observations of the two spacecraft, as well as infrared views from telescopes on Earth, reveal the Eagle nebula as a colorful swirl of gas and dust with a dense core of stars, which appear in shades of red, green, blue, yellow and orange. The stars belong to the star cluster NGC6611. That is one of the most beautiful things I have ever seen. It's like looking at a photo of God creating the universe. A Spooky NebulaCredit: Adam Block, NOAO, AURA, NSFSH2-136 is a an illuminated dark nebula, about 1200 light-years away, towards the constellation Cepheus. Witch's CackleCredit: NASA/STScI Digitized Sky Survey/Noel CarboniThe Witch Head Nebula in the constellation Orion. In this new Hubble image, the backlit wisps along the Horsehead's upper ridge are being illuminated by Sigma Orionis, a young five-star system just out of view. 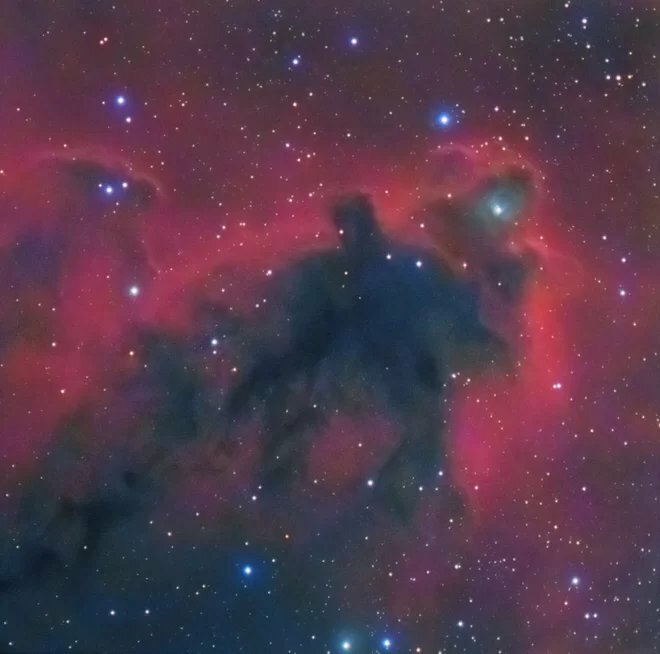 Along the nebula's top ridge, two fledgling stars peek out from their now-exposed nurseries. 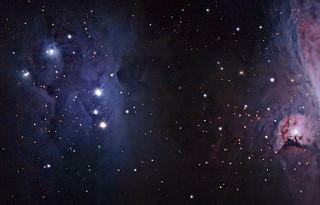 Scientists know a harsh ultraviolet glare from one of these bright stars is slowly evaporating the nebula. Gas clouds surrounding the Horsehead already have dissipated, but the tip of the jutting pillar contains a slightly higher density of hydrogen and helium, laced with dust. This casts a shadow that protects material behind it from being stripped away by intense stellar radiation evaporating the hydrogen cloud, and a pillar structure forms. Astronomers have used NASA's Hubble Space Telescope to photograph the iconic Horsehead Nebula in this new, infrared light to mark the 23rd anniversary of the famous observatory's launch aboard the space shuttle Discovery on April 24, 1990. Nice ! I have seen many photos taken of this nebula throughout the years and this is the best detail yet. Notice the eye on the horse, I've never seen that. This is amazing ! It usually isn't visible in a telescope (I've tried , so have many others ) and normally requires long exposures to resolve the image. Hubble continues to impress. It looks more like a dinosaur to me...or maybe a dragon. I ain't seeing no horse. asa has captured a new image of a hand-shaped formation around a star that has been dubbed the "hand of God". 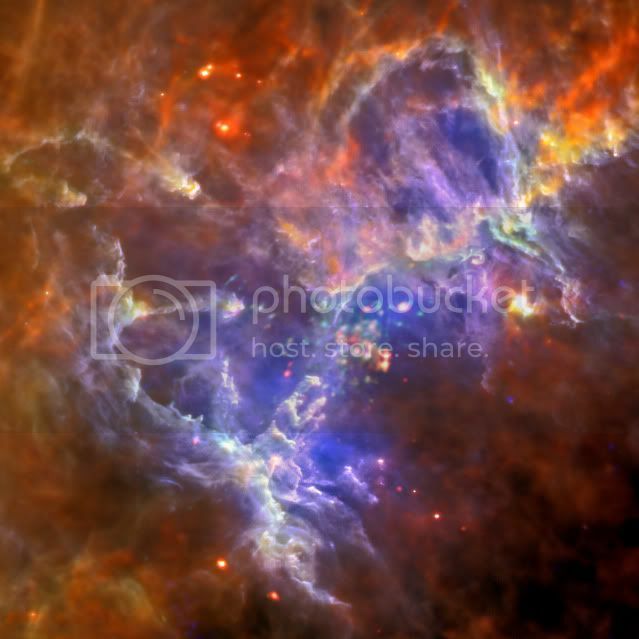 Scientists said it was a nebula - a cloud of gas - around a neutron star called PSR B1509-58, or B1509 for short. Neutron stars are created when massive stars run out of fuel and collapse. When it collapsed, it also caused an explosion which cast gas and material out into space. It revolves at seven times a second and in doing so it throws out huge amounts of sub-atomic particles in streams. It is the interaction between the particles and the gas that, when photographed with a special camera, create the amazing image. A previous image of the "hand" was captured in 2009 by Nasa's Chandra X-ray observatory - a telescope contained in a satellite which is able to see X-rays 100 times fainter than any detector on Earth. The new image was taken by the agency's "black-hole hunting" Nuclear Spectroscopic Telescope Array (NuStar) which is able to see even the highest energy X-rays. Nasa says B1509 is 17,000 light years away. The Cat's Eye Nebula features concentric shells or bubbles of gas and dust. 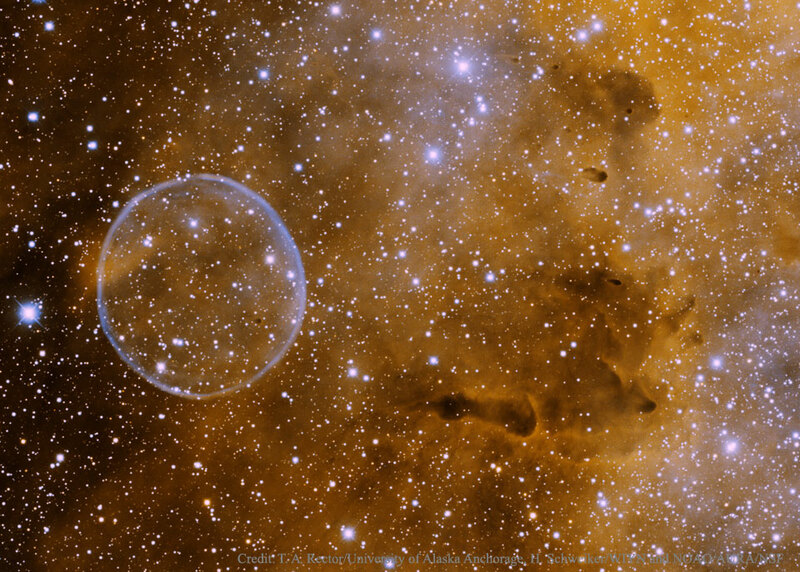 This Gemini Observatory image of Kronberger 61 shows the ionized shell of expelled gas resembling a soccer ball. The light of the nebula here is primarily due to emission from twice-ionized oxygen, and its central star can be seen as the slightly bluer star very close to the center of the nebula. Astronomers using ESO’s Very Large Telescope in Chile have captured this image of planetary nebula Abell 33. Image released April 9, 2014. The Rosette Nebula, also know as Caldwell 49 or NGC 2237, is located roughly 5,000 light years away at the edge of the molecular cloud Monoceros, or the Unicorn constellation. Astrophotographer bob Davis captured this photo from Sumter, S.C on Jan. 28, 2012. The image was released to SPACE.com on Oct. 8. The shimmering colors visible in this NASA/ESA Hubble Space Telescope image show off the remarkable complexity of the Twin Jet Nebula. The new image highlights the nebula's shells and its knots of expanding gas in striking detail. Two iridescent lobes of material stretch outwards from a central star system. Within these lobes two huge jets of gas are streaming from the star system at speeds in excess of one million kilometers per hour. The M in this name refers to Rudolph Minkowski, a German-American astronomer who discovered the nebula in 1947. The PN, meanwhile, refers to the fact that M2-9 is a planetary nebula. The glowing and expanding shells of gas clearly visible in this image represent the final stages of life for an old star of low to intermediate mass. The star has not only ejected its outer layers, but the exposed remnant core is now illuminating these layers -- resulting in a spectacular light show like the one seen here. However, the Twin Jet Nebula is not just any planetary nebula, it is a bipolar nebula. Within the wings, starting from the star system and extending horizontally outwards like veins are two faint blue patches. Although these may seem subtle in comparison to the nebula's rainbow colors, these are actually violent twin jets streaming out into space, at speeds in excess of one million kilometers per hour. This is a phenomenon that is another consequence of the binary system at the heart of the nebula. These jets slowly change their orientation, precessing across the lobes as they are pulled by the wayward gravity of the binary system. This is a reprocessed image of the Running Man Nebula (left) and De Mairan's Nebula (right) that was taken last year on 10/4/2014. These two objects are found right next to the Great Orion Nebula in the sword of the constellation Orion. With the Fall fast approaching Orion is returning to the night sky, a real treat to look at/image in the Fall/Winter months. This image was a part of a mosaic attempt of this area which can be seen here: flic.kr/p/pf597z I really look forward to spending more time on this area this season. With this image there was quite a bit of noise to deal with and it was difficult to pull out the faint details since this image set is kind of lean, only 9x120" @800 ISO lights. I really want to spend more than a couple nights on these targets and the Great Orion Nebula, then move on to all of the other awesome objects/areas found in the constellation Orion this season. A zoom into the Hubble Space Telescope photograph of an enormous, balloon-like bubble being blown into space by a super-hot, massive star. Astronomers trained the iconic telescope on this colorful feature, called the Bubble Nebula, or NGC 7635. Sometimes I get a little jealous of pre-20th century astronomers. Nowadays, if you discover something new you get to name it. Back then, if you discovered something new, it got named after you. Such was the case when Charles Wolf and Georges Rayet happened upon a strange star one night at the Paris Observatory in 1867. I don't know what they said to each other after the discovery — even if I could overhear them, my French is a little too rusty — but it probably wasn't, "Sweet! Our names get to be featured in a skipped-over chapter of every astronomy textbook of the future!" 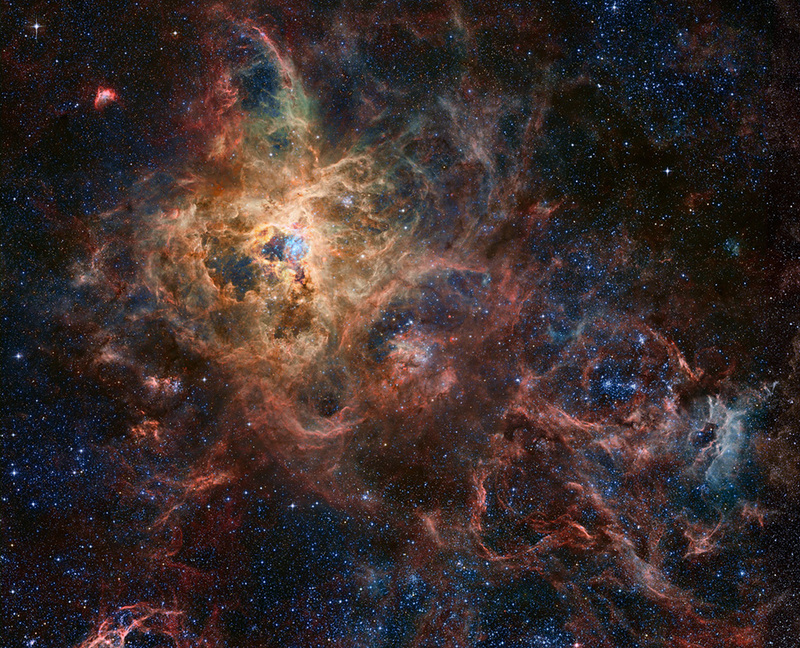 Astronomers just uncovered the most detailed view yet of a massive stellar nursery, and the photos are absolutely stunning. 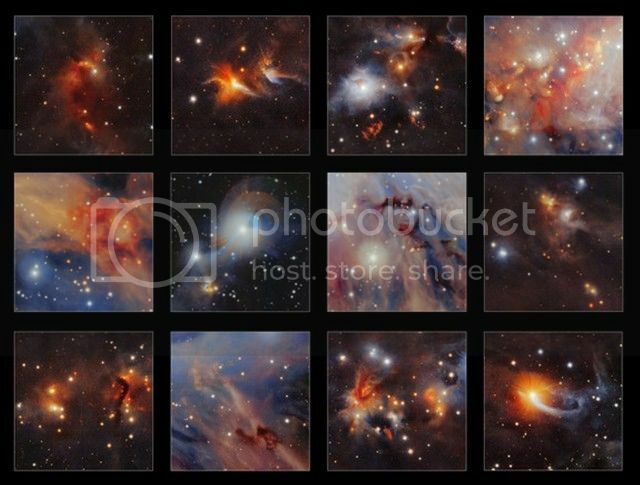 Watch the video to see pictures of the Orion A molecular cloud, a dense region filled with cosmic gas and dust that tend to block the view of all the blooming baby stars that lie within. The cloud is located about 8 degrees south of Orion's sword in the constellation Orion the Hunter. Using the Visible and Infrared Survey Telescope for Astronomy (VISTA) at the European Southern Observatory's (ESO) Cerro Paranal facilities in Chile, astronomers were able to see through the haze and identify nearly 800,000 celestial objects, including stars and protostars, the dusty disks of soon-to-be blazing balls of nuclear fusion. These new images are part of the Vienna Survey In Orion (VISION) sky survey, a project based at the University of Vienna in Austria. VISION seeks to map all of the star-forming clouds within 1,600 light-years of Earth that are visible from the Southern Hemisphere. You can explore the image in an interactive app on the VISION website. By detecting light in infrared and near-infrared wavelengths, VISTA and other infrared telescopes can "see" things in space that are otherwise invisible to the human eye and other optical telescopes. Not all of the objects in this survey were new discoveries, but the researchers did identify five new protostar candidates — freshly forming stars-to-be — in the stellar nursery. Several potential new galaxy clusters were also spotted in the region. "This represents better depth and coverage than any other survey of this region to date," ESO officials said in a statement. Previous near-infrared surveys of Orion A "are limited in their depth and sensitivity, and/or only cover a fraction of the entire molecular cloud," the study's authors wrote in their research paper, which was published today (Jan. 4) in the journal Astronomy & Astrophysics. Zoom through the Orion Nebula in 3-D, courtesy of NASA. 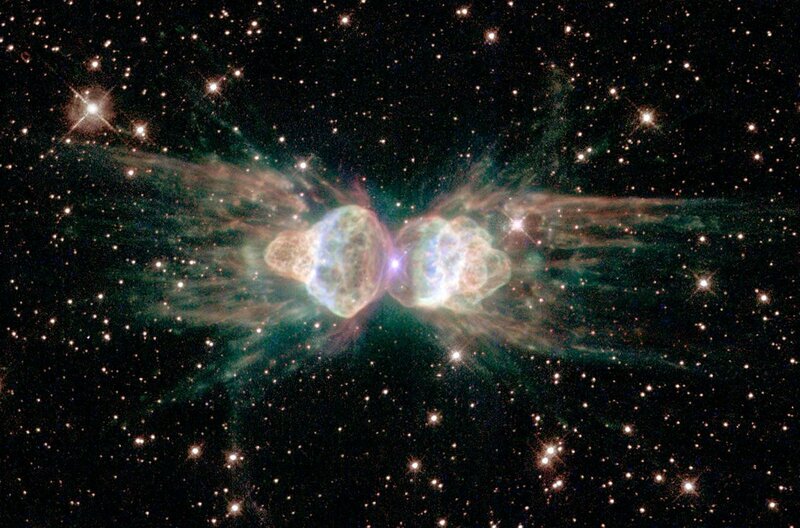 The so-called "ant nebula" (Menzel 3, or Mz 3) resembles the head and thorax of a garden-variety ant.